"There are only two kinds of physicians qualified to be licensed for the unlimited practice of medicine in all 50 states; those holding the M.D. degree, and those who have earned the D.O." Osteopathic physicians perform surgery, deliver babies and prescribe medicine in hospitals and clinics across the nation. 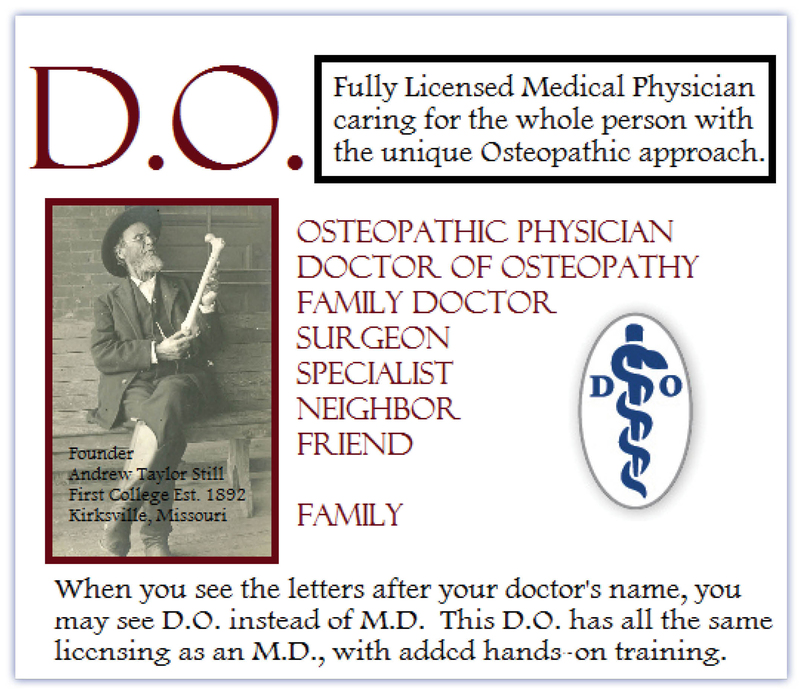 Whether they are family doctors or specialists, D.O. 's use all the tools of modern medicine...and more. D.O. 's help patients develop attitudes and lifestyles that don't just fight illness, but prevent it. They give special attention to how the body's nerves, muscles, bones and organs work together to influence health. And, through osteopathic manipulative treatment, they can use their hands to diagnose injury and illness and encourage the body's natural ability to heal itself. These "extra touches" distinguish the D.O. 's whole-person philosophy of medicine. It's a century-old tradition of caring for people, not just treating symptoms.